Ode to our Favorite Witch: Penny Dreadful! One of the best parts of any convention for the Daves is re-connecting with the many horror hosts we have met since we began this site in July of 2010. The only downside is that in many instances, there is so much going on that it is hard to really spend some quality time with them. Between them signing autographs and taking pictures and us covering the event, down time is rare. Luckily this changed somewhat at the ROCK & SHOCK Convention in Worcester this year. ROCK & SHOCK, though a small convention when compared to something like HORRORHOUND WEEKEND, certainly packs in a lot in a relatively small space. 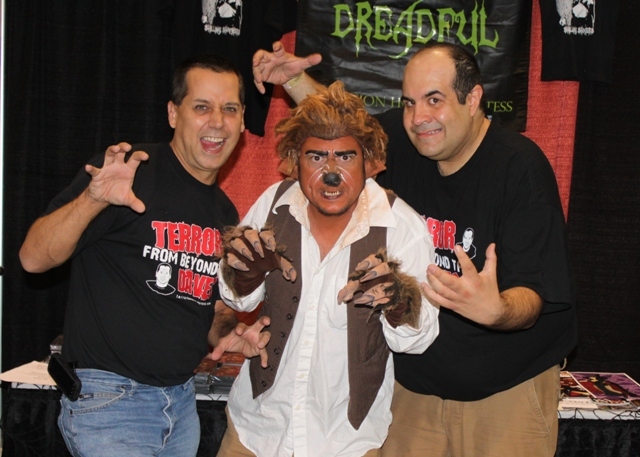 Since they are the only horror convention in the MA/RI/CT area they not only draw decent crowds of fans but they are also able to draw in great celebrities. 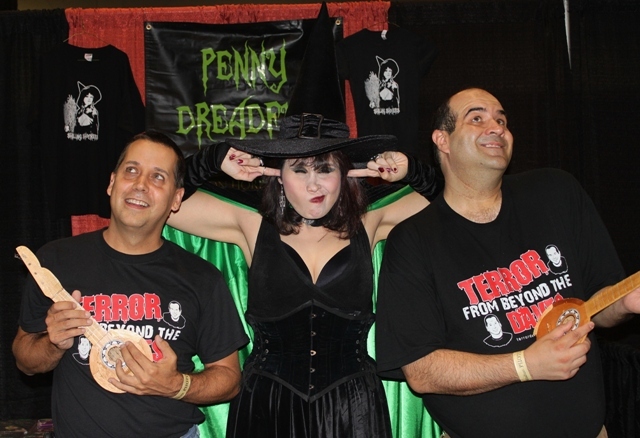 It is only natural that Penny Dreadful, New England’s most popular horror host, makes an annual appearance here! Since the Daves had not seen her since the 2010 edition of this convention, we were really looking forward to seeing her and the cast of Shilling Shockers once again. Penny Dreadful is no stranger to Terror From Beyond The Daves and its readers. 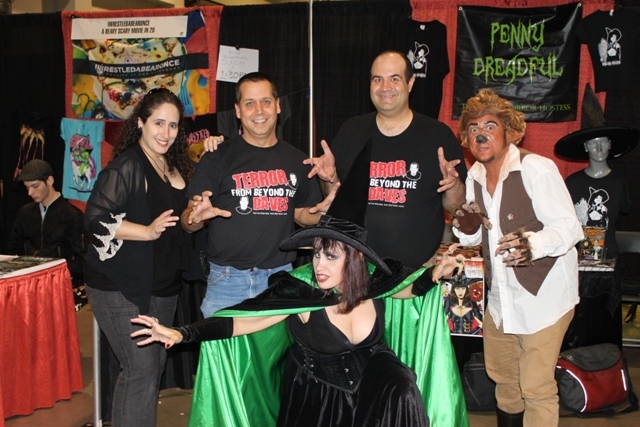 Penny was first featured in a Horror Host Spotlight by Dave Fuentes HERE and even Garou was covered HERE on a piece on horror host sidekicks! The Daves are also no stranger to Penny as at last year’s ROCK & SHOCK event we proclaimed our love of her by posing with her holding pink hearts. This year we continued the tradition by serenading her in song! Penny has proven time and time again that she is such a class act and great sport, willing to put up with our shenanigans and contribute her own brand of humor to our pictures and videos. Garou, here werewolf sidekick has also always been fun to hang with. He stays in character always and is hilarious in his own way. Though he speaks in werewolf, he is actually very easy to understand once you spend some time with him. Unfortunately we only saw Manfred briefly on Friday evening but were fortunate to finally meet Rebecca Paiva, director and producer of Shilling Shockers, on Saturday. Rebecca goes above and beyond in the production of this show which is why Shilling Shockers stands above the rest when it comes to public access hosts. She was kind enough to bring us a copy of the first episode of the new season, featuring the 1922 classic NOSFERATU. Rebecca also painstakingly redid the subtitles for this version which shows once again how much effort is made to bring Shilling Shockers to the air. One of the benefits of conventions like ROCK & SHOCK is not only taking great pictures but also filming video promos. Penny and Garou were asked to participate in two promos on the fly and with how they turned out, it shows how spontaneous and funny both are in situations like this. The first is a promo done for Terror From Beyond The Daves whereas the second one features Dave Fuentes interviewing them. One of the definite highlights of ROCK & SHOCK was spending time with Penny, Garou, Manfred and Rebecca and if you have the opportunity to meet them in person, I highly recommend it. We had so much fun with them that we visited their booth many times and Penny even helped break the ice in meeting Gary Busey (this will be covered in a future blog). Not only do they genuinely appreciate their fans, but since they stay in character when you talk to them you can really appreciate how talented and funny they are! I know for the Daves the next time we see the cast and crew of Shilling Shockers cannot happen soon enough! This entry was posted in Horror Hosts and tagged Garou, Horror Host, hosts, Manfred, Penny Dreadful, Rebecca Paiva, Shilling Shockers. Bookmark the permalink. ← ORMON GRIMSBY’S House of Halloween Hullabaloo! is penny dreadful a pseudonym for rebecca paiva??? is rebecca paiva penny dreadful?? ?